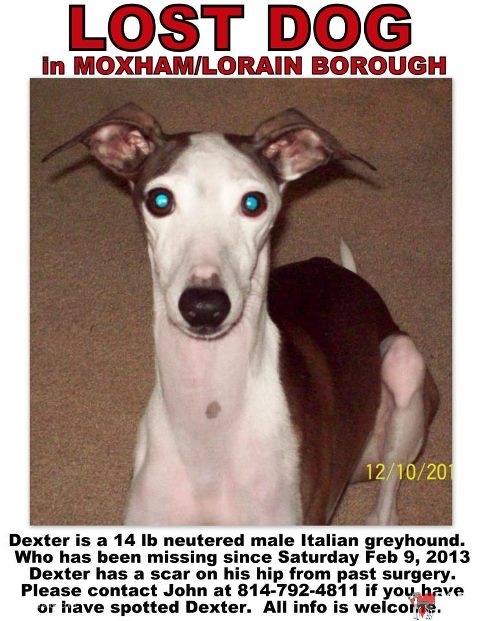 An Italian Greyhound named Dexer was lost in the Lorain Borough / Moxham area of Jonstown, PA Pennsylvania. He is white and brown, neutered, male with a scar on his hip from a past surgery He went missing February 9, 2013. If you have any information on Dexter, please contact John at 814-792-4811 immediately – his family misses him! 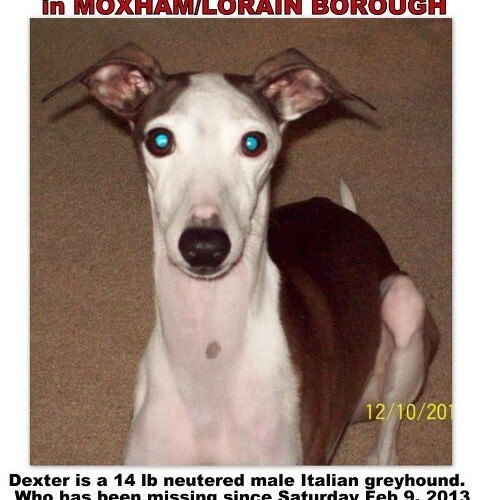 This entry was posted in ALL, Lost dogs and tagged 14lbs, 15lbs, boy, brown, dexter, dog, found dog, found italian greyhound, iggy, john, johnston, lost dog, lost italian greyhound, male, neutered, pa, Pennsylvania, white. Bookmark the permalink. I so hope he is found safe….